Today over at Everybody Art Challenge the theme is "Monochrome". 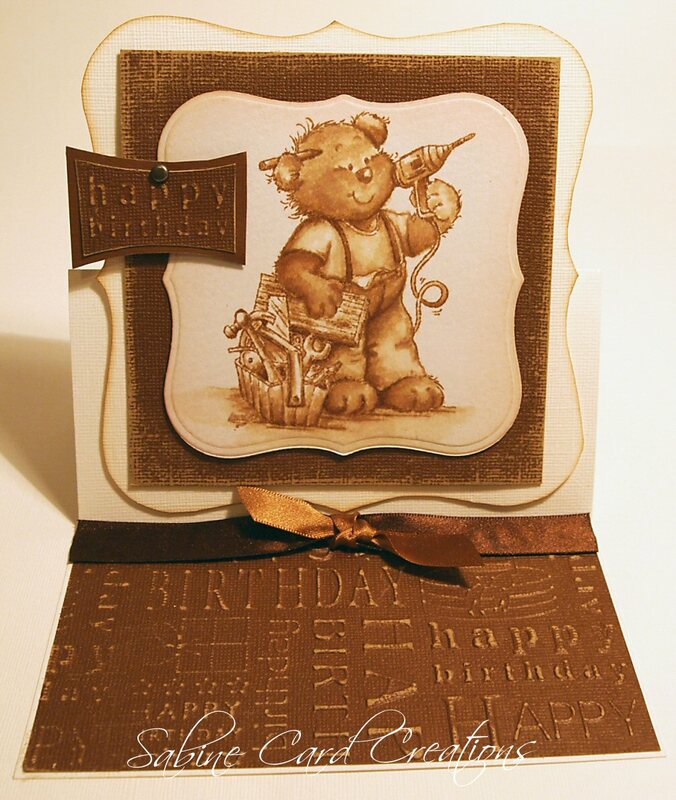 I've made a simple masculine easel card using brown and cream as my colour scheme. Instead of using my trusted Copics, this week I thought I would try a different technique and coloured the image using Tim Holtz Brushed Corduroy Distress Ink. The image is a cutie from Lawrence Stamps, can you believe I purchased this last October and have only just stamped it up. I seem to be accumulating quite a few stamps that haven't seen the light of day as yet. I've used Tim Holtz Distress card and have sanded around the edges to reveal the lighter colour underneath. The embossed Happy Birthday card I created by using the Papermania embossing board. I bought this at the Farnborough show last weekend and it was a bargain for £2.99. I have created the sentiment using the same embossing board. To finish off I used some ribbon and a brad. I'll be back later with this weeks card for Papertake Weekly. Oh this is fabulous and so cute Jenny.